This drawing, from the mid 19th century, comes from a volume titled ‘A Collection of Original drawings by Roshard, A Johnson, Gow etc made to illustrate the works of Sir Alexander Morison on Mental Diseases’. The original illustration is housed in our collections. The brief caption on the reverse reads ‘Martin - Bethlem C D set fire to York Minster’ – just a tantalising glimpse of what is a fascinating story. Jonathan Martin had first been press ganged into naval service before becoming a Methodist preacher – however, he clearly then had some form of breakdown (which involved threatening to shoot the Bishop of Oxford) and was committed to an asylum in 1817. He managed to escape in 1821 and returned to preaching (although this time unofficially, having been disowned by his fellow worshippers). He sang hymns, and attempted to sell copies of his life story – without, it seems, much success. So after attending evensong at York Minster on 1st February 1829 he hid in the cathedral, set fire to the choir, and escaped through a window. The roof of the central aisle was entirely destroyed, as was most of the woodwork in the interior, including the bishop's throne and the pulpit. 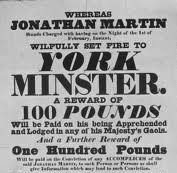 Martin was arrested on 6th February and tried at York Castle. 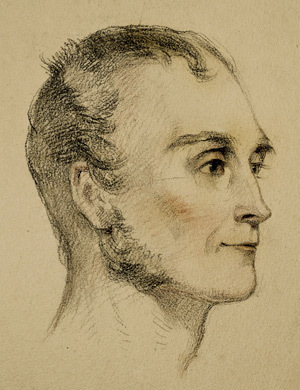 He was declared not guilty on grounds of insanity and sent to the Criminal Department of Bethlem Royal Hospital, London, where he died on 3 June 1838. All our externally deposited collections are now sorted and listed on our online catalogue here.